Many Firefox users complain that the browser slows down over time. It sometimes takes too long to load, and its once-zippy performance can feel sluggish. The free Firefox add-on Vacuum Places Improved promises to solve at least part of that problem by compressing an important database used by Firefox. Goose a sluggish Firefox browser with Vacuum Places Improved. The database targeted by the add-on is Places, which stores information about bookmarks, history, the address bar (commonly called the Awesome Bar), and more in Firefox 3 and greater. The more you use Firefox, the more information is in the Places database, and the more fragmented it becomes. 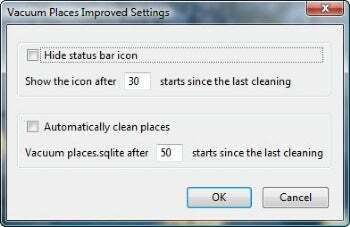 Vacuum Places Improved defragments that database, and claims that by doing so, it speeds up your Firefox browsing, and especially the speed with which you can search through your history and Favorites using the Awesome Bar. How much of a performance increase will you see? Until you try the add-on, there's no way to know. Some people have found substantial speed increases, but not everyone has. In my testing, Firefox felt zippier after using it, although not substantially so. But others have reported sizable speed increases, including faster program startup. Given that it's free, anyone who uses Firefox 3.5 or above should give Vacuum Places Improved a try.